The Palais des Nations in Geneva, Switzerland. “Excuse me, are you from the Soviet Union?” The question in Russian was almost superfluous. The man I addressed from behind was a typical homo sovieticus. The wrong suit and shoes, a typical haircut. The year: 1987. 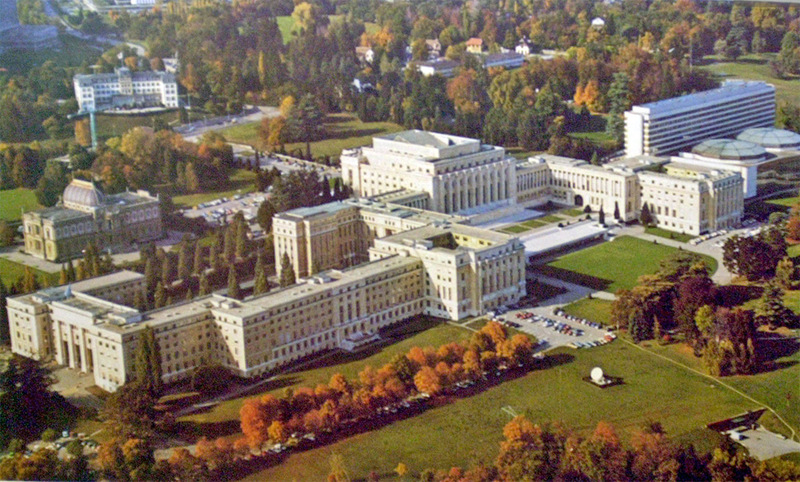 Location: the Palais des Nations, the European headquarters of the United Nations. He was looking at advertisements for ‘Apartments for Rent’. Thus began my contacts with Mikhail Petrukhov, KGB operative*. Later Mikhail told me he thought at the time I was working for a Western intelligence service. Who else would address him from behind in the correct language? The answer was simple. I had studied Russian language and literature in university, and had a keen interest in the Soviet Union. Identifying him as a Soviet citizen was a piece of cake. In the weeks that followed we met now and then in the UN coffee bar. Mikhail was a Soviet diplomat, accredited to the United Nations Office in Geneva, specialized in the UN development organization UNCTAD. But it soon turned out his real expertise lay in topics that had nothing to do with ‘Trade and Development’: human rights, nuclear weapons, Afghanistan, and other issues popular in the late 1980s. At first my contacts with this Soviet diplomat were no different than those with other diplomats in the Palais des Nations. You usually heard a bit more from them than at the boring weekly media briefings of the UN itself. But soon Mikhail made a mistake. We had lunch in an expensive restaurant. At the time I was a dead-poor freelancer, struggling to keep my head above water in one of the most expensive cities in the world. Anyway, after the lunch the waiter presented the bill. I offered to pay. He paid, of course. But when we left he didn’t pick up the bill and left it on the table. From that moment onward, I paid extra attention to what Mikhail said and did. My first job had been with the Dutch section of Amnesty International, an organization which was conscious of possible hostile activities of secret services. I picked up a few bits of useful information from them. Soon, Mikhail did something which betrayed his identity beyond doubt. As far as journalists were concerned, the KGB worked mainly to develop ‘agents of influence’: journalists who were not paid by the KGB but did disseminate Soviet points of view. In addition, they analyzed the ‘targeted journalist’ in terms of possible blackmail: ‘kompromat‘ (compromising material). This especially held true for journalists who later might find themselves in an important position, such as press spokesman at a ministry. In 1987, the UN Conference on Disarmament (CD) was negotiating a worldwide ban on chemical weapons. As hardly any other journalists covered this, I did, and soon became one of the ‘experts’ on this particular topic. Doors that hitherto had been closed to me opened and there were invitations for interesting chemical weapons-related UN trips to the Soviet Union and Japan. The author of this article during a 1987 UN visit to the Soviet chemical weapons facility in Shikhany (Saratov oblast). Then Mikhail made his opening move. “You know so much about chemical weapons”, he told me. “Would you be willing to write an article about the state of play at the CD negotiations for the internal magazine of our Ministry of Foreign Trade?” He added the article would have to be published under his name, of course. Alarm bells were ringing all over the place. Internal magazine? Ministry of Foreign Trade? Under his own name? What to do? Mikhail had proven to be a reliable source of information. But this? I decided to proceed, while staying on the safe side. So, I made a summary in English of an already published article that I had written for the Dutch newspaper ’Trouw’. A few weeks later he made another move that betrayed him. After yet another dinner in a busy restaurant in downtown Geneva he produced an big envelope from his jacket. “Here is the money for the article, they really liked it”. I waved my hands in front of me, conscious that there might be a guy with a camera elsewhere in the restaurant who could record a highly suspect event, to be filed under kompromat. I told Mikhail that I appreciated the useful information he provided now and then, as well as the free dinners. But taking money? No way! Later I was contemplating Mikhail’s move while at my desk in the press room in the Palais des Nations. He had clearly gone too far. I consulted an American colleague whom I had often seen in the company of another Soviet diplomat. Turned out his story was almost an exact copy of mine: lunches, dinners, ‘forgotten’ bills, a request to do something for them. I decided it was time for a counter-offensive! The occasion presented itself during a reception at the Soviet mission to the UN on the day the USSR commemorated the 1917 October Revolution. I scanned their ranks for someone higher in the hierarchy than Mikhail. Perfect suit and shoes, but a wrong hairdo and glasses led me to someone who turned out to be the First Secretary of the Permanent Representation to the UN. These were the Gorbachev years, so we talked about ‘Glasnost’ and ‘Perestroika’. “We like it”, I said, “but the behavior of the ‘organs'(read: KGB/GRU) is still old-fashioned.” And I told him about my experiences with Mikhail Petrukhov, without mentioning his name. A few days later Mikhail Petrukhov called me on my UN extension number, something he had rarely done before. Coffee? Sure. The man turned out to be in panic. “What on earth did you tell them?”, he asked. It turned out that my remarks at the reception had led to a emergency meeting at the Soviet UN mission. Diplomats were told the ‘the UN journalists’ had complained about the behavior of ‘the organs’. Not true, but who was I to complain? I told him how stupid he had been, what with the forgotten bill; the request to write something for him, and the attempt to give me an envelope in a packed restaurant. “You are a pretty stupid spy”, I told him. “I wonder what to do with you. Shall we have you extradited?”, adding that I knew the Geneva head of police through a colleague of mine, and that extradition could easily be arranged. And there I head him cornered, so to speak. For KGB operatives and their families, Geneva was one of the most wonderful postings in the world. Mountains! Skiing! A huge lake! Affluent! Clean air! Mikhail became as meek as a lamb. We continued to be in touch until I left Geneva in early 1990. Now and then he’d spoon-feed me nice scoops which invariably turned out to be true. He never asked me to do something for him, with one exception. My first job had been spokesman of the Dutch section of Amnesty International (AI), at the time the largest of the organization. Mikhail knew that. And since the official AI representative in Geneva was new and inexperienced, he approached me about an issue which, in his view, was highly delicate. The idea of opening an official Amnesty International office in Moscow. In those years, the idea alone was outright revolutionary. Amnesty had bombarded the Soviet authorities for decades with petitions for political prisoners, and now an office? One day he told me that the International Secretariat had sent a letter to the Soviet government, proposing to send a delegation to Moscow to discuss the possible opening of the local AI office there. “Tell them it doesn’t work that way”, Mikhail told me. “First they’ll have to talk on neutral ground with Fyodor Burlatsky (Gorbachev’s troubleshooter at the time, hdv)”. So, I called Amnesty’s international secretariat in London and passed on the message to their legal adviser, the late Sir Nigel Rodley. A long silence on the other side of the line. “How on earth do you know about that letter, it is highly confidential”, Nigel said. I explained that I was just acting as a messenger boy for someone I believed to be a KGB operative. Later, I heard that AI’s secretary-general had indeed met with Burlatsky in Paris, and that after a while AI got its office in Moscow. After the dissolution of the Soviet Union I heard that the ‘Amnesty International’ issue had been hotly debated between the KGB (against) and the ministry of Foreign Affairs (in favor). That couldn’t have been the somewhat oafish Mikhail, I thought. It wasn’t. The Americans somehow knew (but that wasn’t rocket science) about my contacts with Anatoliy Shchekochikhin, the media spokesman of the Soviet delegation to the UN Conference on Disarmament. He never gave me false information, something I couldn’t say about his U.S. colleagues. He was a ‘modern’ Russian who had never asked me anything odd, nor fed me false information. I must confess I did organize a private party for him once with two nice Swedish girls for him once, in a bungalow I had borrowed from a friend. But rest assured. Nothing out of the ordinary happened. I told my American interlocutor: ”If all Russian diplomats are like him, you needn’t worry”. But it was clear he didn’t appreciate my answer… Years later, in 2001, Anatoliy Shchekochikhin was one of 50 Russian spies extradited from the U.S., the largest Persona non grata action since the end of the Cold War. And thanks to Google, Mikhail turned up later as a diplomat in Finland. *KGB operatives don’t show you their ‘membership card’. I deducted his true profession through his behavior. I never found out what he did in terms of ‘spying’. Obviously intelligence services in Geneva tried to find out negotiating positions at the UN, WTO, START talks etc. . Mikhail did tell me once they would, at night, copy research papers at the World Health Organization (WHO) in order to save money for the Motherland. **** Another anecdote concerns John Tower, a former Republican senator who was appointed as head of the US nuclear weapons negotiating team with the Soviets (START talks) in Geneva in 1985. He was nominated to be the next US Secretary of Defense in 1989. Lo and behold, information popped up that Tower had been seriously compromised by a KGB ‘swallow’ (female operative) while in Geneva. The initial scene of the action: the Mr. Pickwick bar at 80 Rue de Lausanne. The bar was just around the corner from the building on Avenue de France where the US arms control people worked at the time. I don’t know the details of the kompromat the KGB gathered on Tower. But it must have been pretty serious. I read that the FBI called in the CIA to investigate John Tower and some of his fellow START negotiators, and that the CIA produced a 120-page report on the matter. In a unprecedented move, the Senate rejected his nomination by 47–53 votes. Dit bericht werd geplaatst in Intelligence, Russian Federation, Soviet Union, United Nations en getagged met FSB, Genève, John Tower, KGB, kompromat, spies, Trouw, UNOG. Maak dit favoriet permalink.